The new Audi TT and TTS coupes are manufactured at Audi Hungaria Motor, the subsidiary of the German automaker that also assembles the very popular Audi A3 Sedan. The Audi TT is the smallest and lightest car so far built on the MQB modular platform and three different versions are available at the moment, a 2-litre diesel with 184 PS, a 2-litre base petrol with 230 PS and available with quattro all-wheel drive or a 310 PS flagship TTS model. Over half a million units of the previous two TT generations have been built and sold. The German company believes that the technology and performance on offer could make the third generation an even more successful car. The first TT was assembled in 1998, its replacement arriving in 2006. We firmly believe that at least one more engine and a convertible version of the Mk3 two-door will be available within a year. Audi's introduced the original TT with a comprehensive launch programme putting fashion forward with a stylish coupe that neatly summed up the design direction the company was headed in. TT has evolved considerably since then. The third-generation TT, replacing the original twice over with ever-more performance-focused features. In November 2014, the plant in Hungary celebrated its 500,000th TT. 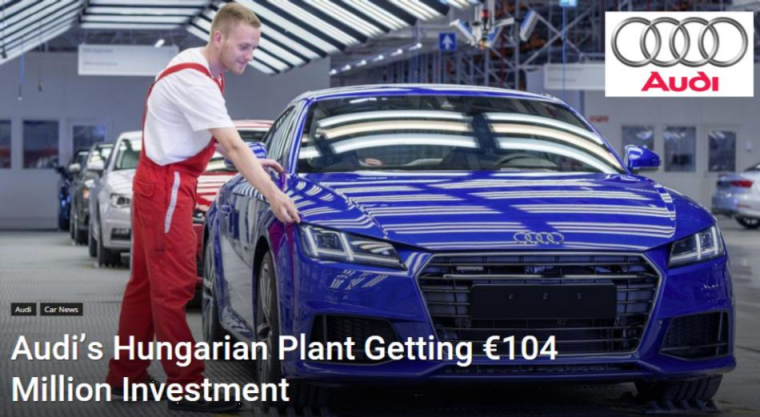 Of that figure, 19 million euros will come directly from the Hungarian government while Audi itself will be responsible for providing the rest of the funding. As part of the investment, the plant will be expanded and 380 new jobs are expected to be created. As it stands, the facility produces the Audi A3 sedan, A3 cabriolet, TT coupe and TT roadster as well as a number of Volkswagen Group engines. It remains to be seen if any additional Audi models will be produced at the factory as part of the expansion but there's certainly a possibility it will soon begin producing the third Audi TT variant, expected to be a crossover or four-door sport-back model.